The Wild Chase makes me sad for many reasons. It's a DePatie-Freleng Looney Tunes short, made after Warner Bros. shut down their animation studio. Consequently, it has much lower budget resulting in a cartoon which looks nowhere near as good as those from the fifties, forties, or even the thirties. Also, most of the DePatie-Freleng cartoons featured stories that most certainly did *not* need to be told. They were tired, and becoming increasingly lame. A race between the Road Runner and Speedy Gonzales? 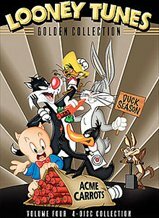 With Wile E. Coyote and Sylvester as the main antagonists? Using those four characters might have created some interesting ideas five or six years before, but sadly not now. All the gags seem flat, mainly because of the lack of superior animation to sell them. The worst transgression of all, however, is that the storyline thinks that Speedy Gonzales can keep pace with the Road Runner! It's simply absurd! The Road Runner would have left Speedy in the dust from the start of the race, and he would have won handily. It's scientific fact, people! Shenandoah is a very good movie, one you never hear mentioned when talking about James Stewart. Well worth your time, unless it's preceded by The Wild Chase, in which case you'll miss most of the film because your eyes were shut tight and your fingers were in your ears and you were singing "LA LA LA LA LA LAAAA!!!!!" at the thought of Speedy Gonzales being as fast as the Road Runner, and you'll quickly lose track of time because seven minutes can seem an awful lot like 35 minutes and vice versa, so you'd probably be better off not watching The Wild Chase at all. Shenandoah wins for not messing with the laws of cartoondom.